Photo: Steven Schnur. Permission granted. I had similar empirical evidence while serving as a chaplain intern with a hospice and elder population. Non-responsive patients would smile or hum, Holocaust survivors sometimes cried tears of joy upon hearing a Shabbat melody that resonated from their lost childhood. After the conference, we talked about music, the Care Buddies and their care partners, and the issue of social isolation. Seivah has addressed that loneliness through our Memory Minyan. But we decided that we needed a more regular, more secular program, a something casual where people would feel that they could just drop by. And of course, it had to be fun for both people in the caring relationship. 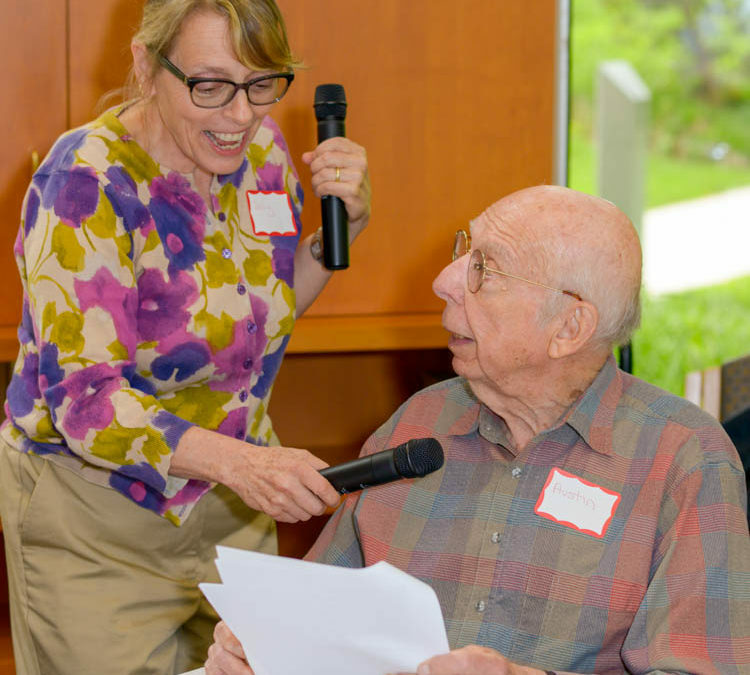 We came up with “Hine ma Tov – How Sweet it is!”, a musical program designed for people with dementia and their care partners, to sing and swing along with music from the 1930’s,40’s and 50’s. We found a great program partner in Westchester Jewish Community Services. We set up a playlist, printed up songbooks with lyrics, and sent out flyers. Congregation Shaarei Tikvah has most generously hosted our biweekly get-togethers which have been enthusiastically attended. The table has been full! It is a joy to spend an hour out of time, singing, laughing, talking about things that matter, and seeing people who might have difficult/fraught moments negotiating the stuff of everyday life, free and happy to be in this moment. Our next gathering of Hineh mah Tov / How Sweet It Is will be on July 4th, 2:00 to 3:30. We’ll take a break for the rest of July, and return, biweekly, in August. Hine Mah Tov / How Sweet It Is! is underwritten by a generous grant from the Seeds of Innovation Project of the Jewish Theological Seminary.